The Calming of the Sea- is a pictorial stained glass window composed of three panels illustrating the miracle of Christ calming the Sea of Galilee. 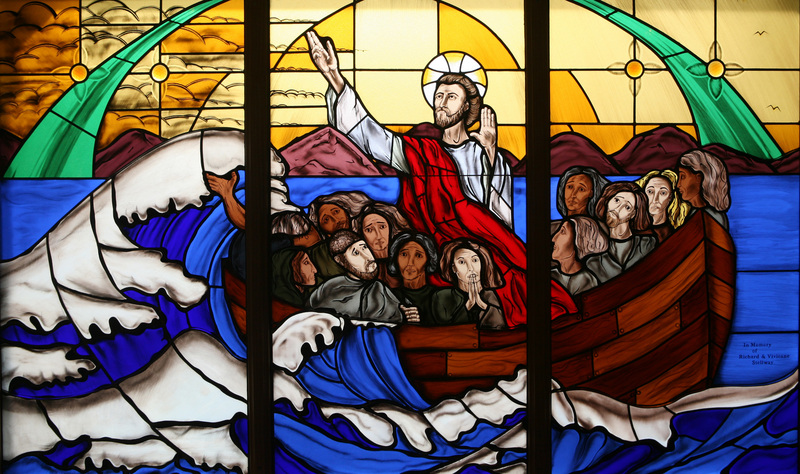 Christ, the central figure, stands above twelve disciples huddled in a simple boat withstanding the stormy chaotic waters in the right panel and the calmer waters in the left. The stained glass consists of three panels totaling 37.65 square feet. It is made up of 280 pieces of glass and four faceted amber jewels. Traditional hand-painting techniques using vitreous pigments that are kiln fired at 1250 degrees for permanency was used to create glass shading, tracing, texture, and lettering. The hair, beards, and mustaches of Christ and the Disciples have additional color layers from glass enamels, which were also kiln fired for permanency. Cathedral glass from Kokomo Opalescent Glass Co., Kokomo, Indiana was used for the boat, clothing, and waves. German New Antique glass from DESAG, Germany was used for the sky, mountains, and water. Hand-blown glass originally imported from Germany, France, or Poland was used for all of the figures hands and faces. Christ’s halo uses clear German New Antique stained amber with silver nitrate and kiln fired for permanency. Perimeter came is 3/4″ wide, while internal came consists of 1/2″, 3/16″, and 1/8″. Lead came in this window is both functional and aesthetic. The window was soldered with Canfield 60/40 and puttied with a secret putty formula from Bera Stained Glass Studios. Each panel is also reinforced with two horizontal 1/2″ by 1/8″ steel rebar bent and soldered to each panel in order to distribute the load (weight) into thirds. Glass and hand-painting techniques, in conjunction with the green circular bands in the background maintain overall design continuity with The Nativity and future stained glass windows. Clear sandblasted glass diffuses the original textured background glass, as well as, the background bushes and traffic. Calming of the Sea was created in memory of Richard and Vivienne Stellway and installed in July 2010. We hope you enjoy the stained glass.